Generally speaking, a 20′ container can hold as much as 28-30 cbm or 980-1,060 cu.ft., while a 40′ can hold about 56-60 cbm or 1,980-2,110 cu.ft. The actual loading Internal Capacity of a container depends not only on the dimensions of the carton boxes but also on many other factors such as the packaging material and the competence and experience of the stuffing personnel. Besides the cargo’s measurement, the stuffing plan should also take the weight into consideration. It is important to note that in many countries the permissible weight limits for road and rail transportation are lower than the maximum payload a container can afford. There are two major types of pallets, “Europallet” and standard pallets. The size of the “Europallets” is 800mm x 1,200mm per piece while the size of standard pallets is 1,000mm x 1,200mm per piece. 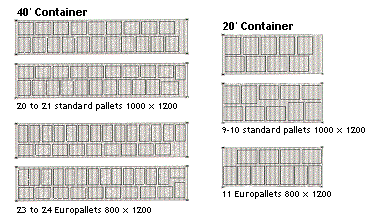 A 20′ container can hold eleven “Europallets” in one tier or nine to ten standard pallets in one tier while a 40′ container can hold 23-24 “Europallets” in one tier or 20-21 standard pallets in one tier.